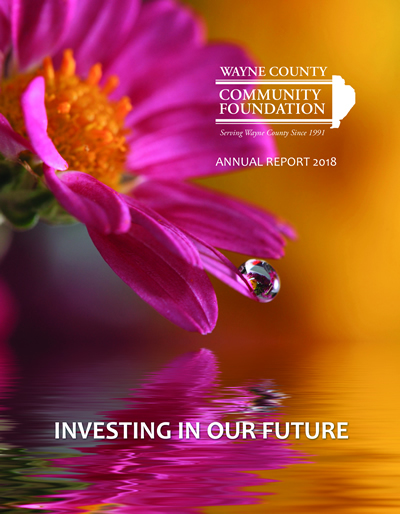 The Wayne County Community Foundation is a non-profit foundation whose primary goal is to build a charitable reserve of funds for the current and future needs of Wayne County. The Foundation uses grant resources to support a wide variety of community organizations, empowering them where possible to thrive, grow and become self-sustaining. The Foundation has funds available. The Wayne County Community Foundation awards grants quarterly to non-profit agencies located in Wayne County that sustain and advance access to the arts, literacy, culture, community development, education, the environment, and health and human services. In response to changing times, the Foundation may at any time redefine its areas of interest, designate new areas of focus, or address specific emergency needs of our communities and its citizens. Non-profit charitable organizations exempt from federal income taxes under section 501(c)(3) of the Internal Revenue Code.